Coming into the holiday season, when many reflect on what they are most grateful for, EVERY BRILLIANT THING strikes a delicate balance between sobering loss and cathartic laughter. Adapting the hit off-Broadway one-character show of the same name written by Duncan Macmillan and starring British comedian Jonny Donahoe, this deeply poignant film recounts a life lived in the shadow of suicide. Emmy® winners Fenton Bailey and Randy Barbato (HBO’s “Mapplethorpe: Look at the Pictures” and “Wishful Drinking”) produce and direct the heart-wrenching yet humorous presentation, which debuts MONDAY, DEC. 26 at 8:00 p.m. (ET/PT), exclusively on HBO. The documentary has its world premiere at Doc NYC, tomorrow, Saturday, Nov. 12 at 3:15 p.m. (ET) at the IFC Center in New York City. This unique film is about depression and the lengths we will go to for those we love. In this acclaimed show, a young boy attempts to cure his mother’s depression by creating a list of the best things in the world. The list grows as he progresses from childhood (“Ice Cream”) and adolescence (“Star Trek”), to college (“Surprises”) and marriage (“Falling in Love”). But when life deals a bitter blow, the list proves to be helpful to the son in ways that it could never be for the mother. Filmed in 2015 at New York City’s Barrow Theatre, EVERY BRILLIANT THING opens as Donahoe greets the arriving audience with hand-written notes instructing them to participate when called upon. He then proceeds to tell a story spanning nearly three decades and several life-changing events, starting with a young boy’s eye-opening first brush with death (his childhood dog), evoking laughter and tears in equal measure. Donahoe charms spectators into acting opposite him in various roles – a veterinarian, his father, his college lecturer, his fiancée – fostering an intimate sense of community through comic dialogues. 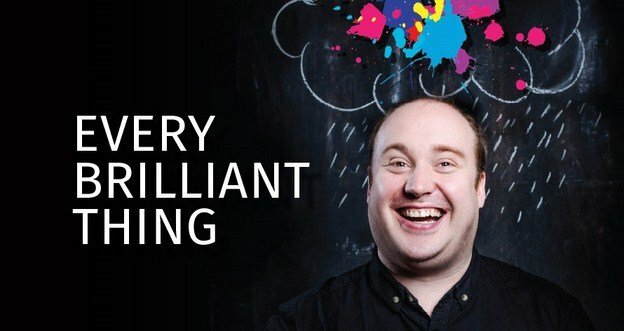 EVERY BRILLIANT THING was first produced by Paines Plough and Pentabus Theatre Company. The stage production was performed at the Ludlow Fringe Festival in Great Britain in 2013 and went on to play the Edinburgh Fringe Festival in 2014. It ran for 16 weeks at the Barrow Street Theatre in New York City, ending in March 2015. Writer Duncan Macmillan was nominated for a Lucille Lortel Award nomination for Outstanding Solo Show in the category of Playwright for EVERY BRILLIANT THING. Macmillan’s latest play is the Olivier Award-nominated “People, Places and Things” on the West End.